Check out this neat cartoon by Adam Ford: http://adam4d.com/drowned-forever/. The following is a reply to a brother who asked about the meaning of the Lordship of Christ. John Piper, in his book "The Future of Justification", has a helpful reply to N.T. Wright on the relation between Christ's Lordship and justification through faith. It's worth reading. He basically asks the question: "Why is it good news that Jesus is Lord?" This question puts the weight upon our understanding of "Jesus" in the statement "Jesus is Lord". What's so good about Jesus being Lord? Piper argues as follows: because the one who is Lord (the supreme authority) is the one who justifies freely by grace. Wright misses this and thinks that "Jesus is Lord" is good news without giving thought to the question Piper raises. For many Christians, "Jesus is Lord" is something disconnected and separate from the gospel. We know that we are justified through faith alone, but what about Jesus being Lord? We acknowledge that He is Lord, but it doesn't mean much to us (perhaps because we aren't a monarchical society), and comes out in the wash as: "I should obey His rules because He's the king". This misses the connection His Lordship has with the gospel. "Jesus is Lord" is a wonderful and powerful truth because it is the gospel (a point Wright rightly emphasizes). It proclaims righteousness through faith because of our understanding of "Jesus", and for this reason only "no one can say Jesus is Lord but by the Holy Spirit." (1 Cor. 12:3) Now the Mormons, for example, say "Jesus is Lord" all the time, and try to obey his commandments, but because they don't understand who Jesus is and the salvation that He gives by grace through faith, they aren't really saying "Jesus is Lord". They known nothing of His kingship. "For, being ignorant of the righteousness of God, and seeking to establish their own, they did not submit to God's righteousness. For Christ is the end of the law for righteousness to everyone who believes." Here we see that the Jews have not "submitted" themselves to God's righteousness. And what is God's righteousness? It is "Christ, the end of the law for righteousness to everyone who believes." Thus to submit oneself to the Lordship of Christ is to submit to the Lordship of "Christ the end of the law for righteousness to everyone who believes". Without this understanding one does not understand Christ, and thus any submission to an unknown Christ is not true submission to Christ. Seen from this light, the old Lordship debate between MacArthur and Ryrie was all wrong. They both had an insufficient definition of Lordship. They both saw Lordship as disconnected and separate from justification, as something additional and other than faith in Christ. With this faulty definition, MacArthur proceeded to argue that a person needs both faith in Christ and submission to Christ's rules in order to be saved, and Ryrie proceeded to argue that a person only needs faith in Christ to be saved, and Lordship (i.e. submission to Christ's rules) can come later. They are both wrong about Lordship. Lordship isn't something other than faith in Christ and it is not separate from justification. The very essence of submission to Christ is submitting to the way of justification through faith! Thus MacArthur is right that in order to be saved we must submit to Christ's Lordship, and Ryrie is right that salvation cannot be conditioned upon obeying moral rules in general. Both are seeing something true, but the definition of Lordship is their problem. Instead, we should understand that when a person puts their faith in Jesus Christ for their justification (Gal. 3:16), they, by doing that, are submitting to the Lordship of Christ who is the end of the law for righteousness. All Christians confess Jesus is Lord by the Holy Spirit. All Christians are saved by grace through faith alone, and this is their submission to the Lordship of Christ. It is failure to trust in Christ--failure to submit to righteousness by faith alone--that is stumbling at the stumbling-stone and rock of offense, ie. Christ. No amount of trying to submit to moral rules and saying with our mouths "Jesus is Lord" counts. Only the Spirit-wrought confession that Jesus is Lord, which is the confession of the true understanding of righteousness, counts. Before reading this book I was not unfamiliar with Viola's message, having some first-hand experience with those who have been deeply influenced by Frank Viola and his teaching on house church. I have seen little-to-no good fruit on account of this mindset. It is, ironically, separatist and elitist. 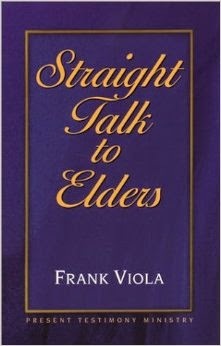 To be frank, "Straight Talk to Elders" is poppycock. Frank Viola argues in it that the office and role of pastor as we know it is unbiblical and that there should be no official leadership in the Christian Church. Church meetings should operate "organically" without any official leadership--no person or persons in the front leading the congregation in worship. Each member is expected to function in an atmosphere of complete freedom from any human authority. Frank explains the Christian's "freedom in Christ" as freedom from all authority other than the authority of Christ. Now, says he, Jesus is our Lord, and no one else can have authority in our lives. When asked about the authority of fathers in families, the answer is unsettling: the New Testament doesn't mention it and it, too, is probably unbiblical. Thus a beautiful Christian truth, that Christ is Lord, is twisted into a kind of earthly anarchy that would make the apostles roll over in their graves. Frank's error is that he defines freedom in Christ as freedom from all human authority rather than freedom from the law of God, as the Bible defines it (Gal. 5:1). True Christian freedom is not freedom from the authority of fathers, political governors, or elders in the church, but freedom from condemnation, fear, judgment, and wrath. If Frank had understood this moral/spiritual freedom that Scripture talks about there wouldn't be books like this, nor the damage they create. Frank fails to see that it is the message of the gospel that sets people free. It is the gospel that saves, heals and restores individual lives, not the method of our meetings. The gospel is completely absent from this book, not mentioned on any page. Frank argues that our method of meetings is wrong and if we fixed it then everyone would be set free. He fails to see that it's the message, not the method, that is ultimately important, and if it is the message that's crucial, then the method is less crucial, so long as the truth of Christ is being proclaimed. One may have all the right methodology, but without the gospel of Christ, it is death, not life. The reverse is also true. Frank's understanding is shallow and mechanical. Frank attempts to provide a basis for his teaching in the New Testament, and in a short space leaps across the epistles, glancing here and there. His argumentation is scant and speculative and at times laughable. For example, in trying to explain away the qualifications for elders in 1 Timothy and Titus, Frank reasons that because Timothy and Titus had been in ministry for a long time already, and since Paul is only now telling them about the qualifications for eldership, eldership, therefore, must not be a big deal! That's right. Eldership is no big deal because the qualification for elders only appears in 1 Timothy and Titus, which were written later in their ministries. Upon this rock Frank builds his church. Frank also argues that Philippians 1:1 is proof that eldership is "no big deal", because elders and deacons are mentioned as a "footnote". "Oh, and by the way, greet those nobodies, too..." Can't you just see how unimportant they are? What then are elders, according to Frank? Elders are nothing more than people who've been Christians longer and have more maturity; they aren't serving in any official capacity; they simply are respectable members of the group, without any more responsibilities than anyone else. That's all. Ordaining elders simply means "acknowledging" them, but acknowledging them doesn't give them any special responsibilities. There are, under no circumstances, to be any leaders in the Church. Except for one circumstance. Not only is Frank's case for leaderless Christianity weak, but he admits in the book that he himself is an exception to the rule! When asked how he practically operates in meetings, Frank explains that he is essentially an apostle who doesn't participate in meetings the way everyone else should, but hops around from meeting to meeting and provides much needed oversight and leadership. He is the exception. That's convenient, isn't it? Frank fails to see the connection between leadership in the Christian Church and the Old Testament, where we find leaders who function as leaders within the people of God, and see promises that God will raise up leaders to feed His flock with knowledge and understanding (Jer. 3:15). It is in fulfillment of these promises that Christ gave to the Church pastors and teachers with the command to "feed My sheep". Frank misses this connection completely. He ironically fails to understand the organic nature of leadership in human affairs. One other thing I will note about the book. As serious as the content of this book is, the entire tone of the meeting is flippant, cheeky, and glib--not the kind of atmosphere befitting the revolutionary subject matter it claims to be. If you're going to come to the Christian Church and tell her that everyone has been doing it wrong for the last 2000 years, you'd at least think to be sober about it. Righteousness is "the quality or state of being right", or conversely, "the absence of wrongness". Comparatively, wetness is "the quality or state of being wet; the absence of dryness." In the Bible righteousness is used in a moral context. God designed human beings to be a certain way both physically and morally. If we are the way we are meant to be physically we are physically whole. If we are the way we are meant to be morally, we are morally whole, ie. righteous. If we are not the way we are meant to be morally, we are unrighteous. No one is righteous before God by their own works because we all sin and fall short of the glory of God. God is morally right; people are not. In God there is an absence of all moral wrongness. In people there is not. When God looked at everyone else He saw that they had "corrupted their way". That is, what they were meant to be they were not; they had spoiled themselves morally, and were not as they should be, ie. they were unrighteous. When God looked at Noah He saw a man who hadn't corrupted his way and was as he was meant to be, ie. righteous. The parallel to and explanation of "righteous" in this verse is "blameless". That is, Noah was morally blameless, ie. he was in a state where there was an absence of moral wrongness. Blamelessness is the equivalent of righteousness because God did not mean for us to have any sin or blame or to be morally crooked in any way. When we are what God designed us to be we are sinless and blameless, and thus righteous. Here, in the very first description of a righteous man, we see that righteousness involves blamelessness. Anyone who is not blameless is not righteous. Anyone who has some moral wrongness does not possess the quality or state of moral rightness. Once again, Job's righteousness is explained as blamelessness. We see again that if a person is not blameless they are not righteous. The rest of the book of Job revolves around this matter of righteousness. Notice that Job goes to great pains to maintain his blamelessness. That is, Job argues that he has not sinned while his friends argue that he must have sinned. His friends get upset with Job for saying that he is more righteous than God (ie. "if you didn't sin then you are blameless, and God is to be blamed for punishing you for nothing!" So their argument goes). Thus we are again instructed about righteousness early on in the Bible. Righteousness = blamelessness. No blamelessness = no righteousness. The place to learn about righteousness (the place where God Himself intends to teach us about it) is in the law of Moses. Righteousness is the central concept in the law. The law sets forth the rule or standard of righteousness, so that if you keep the law you are righteous and if you don't keep the law you are unrighteous. Keeping the law = righteousness. Not keeping the law = unrighteousness. The law is essentially a moral code concerned with our relationship with God and our relationship with our neighbors (so the prophets and Jesus testify; ex. Hab. 1:2-4, Matt. 22:40). It no doubt has a ceremonial aspect to it, but this is not to eclipse the central moral concern of the law (as the prophets were always saying!) Most importantly, life or death, blessing or cursing, depends upon obedience to the law. If you obey the law (ie. are righteous) you will have life and blessing. If you disobey the law (ie. are unrighteous) you will have death and cursing (see Ezekiel 18 for an important example). There is a constant repetition of this theme throughout the entire Bible that "righteousness brings life" and "unrighteousness brings death" (ex. Prov. 10:16). The book of life is the book of the righteous (Ps. 69:28). Not righteous = not in the book of life. Israel seeks righteousness by obedience to the law (Acts 26:7, Rom. 9:31, 10:1-4). This only ends in failure and cursing. Jesus Himself often turned to the law when explaining what righteousness consists of (ex. Matt. 5:20-48, Luke 10:25-29). It is significant that in each case, Jesus defines righteousness as perfection. Jesus taught that righteousness is blamelessness. One must have no sin in order to enter into the kingdom of God and not be cast into hell. Jesus took the commands of the law so seriously that He taught that violating even the very least commandment made you the least in the eyes of the kingdom of heaven, and that if your hand or eye causes you to sin you should cut it off. Sin = go to hell. Not going to hell = no sin. That's the strict teaching of Jesus that hardly anyone takes seriously. In a nutshell, Jesus taught that righteousness was blamelessness because He taught that righteousness consists in keeping the law, and that the law was fulfilled by "loving God with all your heart, all your soul, all your mind, all your strength" (meaning, totally, wholly, completely), and "loving your neighbor as yourself" (meaning totally, wholly, completely). If you don't love God and your neighbor this way (ie. perfectly), you aren't fulfilling the law, and if you aren't fulfilling the law, you aren't righteous; and if you aren't righteous, you aren't going to inherit eternal life but are going to go to hell. This is the teaching of Jesus on the law and righteousness. If a person does not love God with all his heart, soul, mind and strength and does not love his neighbor as himself, that person is not righteous. Righteousness is what is required to inherit the kingdom of God (ex. Matt. 5:20, 6:33, 25:46, etc.) This is because there is a day of judgment coming (so the prophets, Jesus and apostles) which will determine every man's eternal destiny, and the deciding factor is righteousness (ex. Acts 17:31; see also Rom. 2:6-13 which is the first mention of "justified" in the Book of Romans). God is full of wrath against man's unrighteousness (Rom. 1:18), and it is this wrath we are to flee from (Luke 3:7, 1 Thess. 1:10) and be saved from (Rom. 5:9). There is no hope for mankind in being righteous and therefore justified by God on judgment day through obedience to the law. Not because the law is flawed, but because we are. The law will always find us morally unrighteous. Because blamelessness is required, and none of us are blameless, God sent Christ to be the propitiatory sacrifice for our sins so that whoever believes in Him will be found blameless before God on account of that sacrifice. Christ died for our sins because God is a just God who cannot lower His standard of righteousness. The wages of sin is death and God will not fail to punish sin (Ex. 34:7, Josh. 24:19). The point of the cross is the tension between God's righteous standard and His love. God, being righteous, is wrathful against us for our unrighteousness and must deal with our sin. But God, being love, does not want us to perish but wants us to be saved. 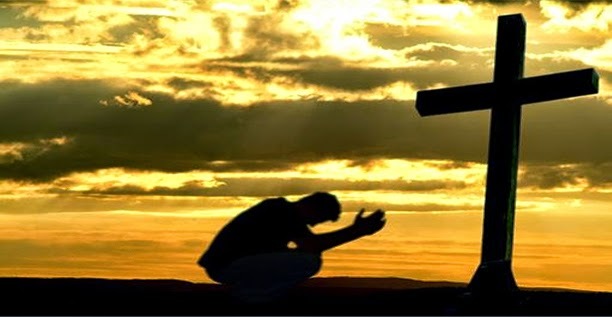 Therefore God, instead of punishing us for our sins, provided Christ as a substitutionary sacrifice for our sins, so that by laying our sins upon Him (Isaiah 53:6) we may be justified through believing/resting/trusting in Him. This mystery of Christ crucified upholds the justice of God and extends peace to sinners, while at the same time revealing to us the true nature of God as a righteous and loving God. Without this mystery we cannot know God. Notice how the righteousness spoken of here is the righteousness that the ungodly receive through faith. Notice also that righteousness is blamelessness, for God does not take any of the believers sins into account. He removes all our sins as far as the east is from the west (Ps. 103:12) through Jesus Christ. This is precisely why Jesus calls on people to believe in Him in the Isaiah 55 manner, so that they can have eternal life. Christ came for sinners, and to sinners He made His appeal. We need a Savior because we are unrighteous. If we were not unrighteous, or if God didn't require righteousness, Christ would not have needed to come and die for us. Christ came to serve us by giving His life a ransom for us (Mark 10:45). Going back to Genesis 6, Noah was righteous/blameless, and the reason is given: "he walked with God." This phrase indicates, not that Noah physically walked with God, nor that Noah met the standard of righteousness by his works (for no one does: Ps. 143:2, Job 15:14, Prov. 20:9, Eccl. 7:20, 1 John 1:8, etc. ), but is simply an idiomatic way of saying that Noah agreed with God. That is, Noah, like Abel, understood righteousness and agreed with God that he was a sinner in need of salvation through Christ. He put his hope in righteousness through faith, not in righteousness through works. He waited for Christ to come and bring him life. Job was hoping in His Redeemer who could deliver Him from death. Job, like Abel, was a man of sacrifice (Job 1:5), looking ahead to the coming of Christ. For this reason Job, Abraham, Noah, David (Ps. 22) and all the saints of old were blameless in God's sight. They knew they needed blamelessness, didn't have it in themselves, and looked for it in Christ to come. Because of this faith they were in fact blameless through Christ. Christians shall in the future take their seat with Abraham, Isaac and Jacob in the kingdom of God because they all share the same hope in Christ providing righteousness for sinners. Righteousness is the key issue. No righteousness = no eternal life. No blamelessness = no righteousness. It is precisely because we are not blameless by our works that we need Jesus Christ and His sacrifice. If we could be righteous by our works, Christ died for nothing (Gal. 2:21).